Fill large stockpot with water and bring to a boil. There should be enough water to cover lobsters completely when immersed. Place live lobsters in boiling water head first to minimize splashing. When water re-boils, turn down the heat, and simmer for 10-12 minutes. Remove lobsters from the pot using tongs; save all the water in stockpot as this is now a flavorful stock to be re-used. Place 10 cups of stock in a clean stockpot and put on low heat. Clean claws and tails of lobsters and reserve meat, legs, and swimmerets. After lobsters are cleaned, place shells in stockpot with 10 cups of stock. Cut bodies in quarters and place in stockpot. Add 1/2 cup tomato paste and simmer on low heat for 1 1/2 hours, stirring occasionally. Pour entire contents of pot through sieve into clean stockpot; this should now be 8 cups of red stock. Place onions, celery, carrots, thyme, parsley and saffron in a large sauté pan, add 4 cups stock from original stock pot and put on high heat for 30 minutes, stirring every 5 minutes. Add 1/2 cup tomato paste and black pepper. Turn down heat and simmer 30 minutes, stirring every 5 minutes. Press entire contents of sauté pan through sieve into stockpot of 8 cups previously made stock. If you prefer your bisque to be thicker, you may add more cornstarch, or perhaps, flour, but have found the bisque thickens nicely over low heat. 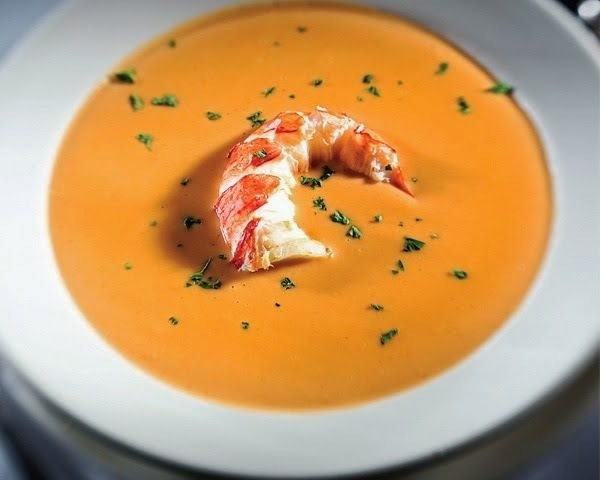 Place pieces of previous cleaned lobster meat in bowl and add 1 cup of bisque.